MoonMarble.com - Assorted - Fancy Mix 5/8"
Bulk Marbles → Target Marbles - approx. 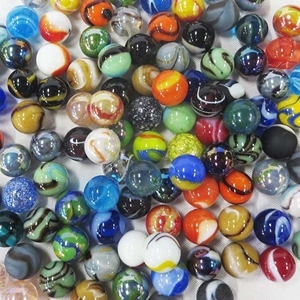 16mm or 5/8" → Fancy Varieties - 5/8" → Assorted - Fancy Mix 5/8"
Fancy Bulk Marbles are approximately 5/8 inch in diameter. The mix contains an assortment of just about every marble available from the Vacor Factory in Guadalahara, MX. If you are looking for as much color and variety as you can get. This is it! These marbles work well in the Amaze N Marbles, Block N Roll, Frigits, and Quadrilla marble runs that we sell. They are sold in bulk quantities. There are approximately 80 to 90 of these 5/8" diameter marbles in a 1 pound bag and approx. 250 in a 3 pound bag. Sizes, colors, and styles may vary slightly. Warning! : Choking Hazard. This toy is a marble. Not recommended for children under 5 years.